Prince Harry has not been having an especially relaxing time at the Invictus Games, the international Paralympic tournament he founded in 2014. 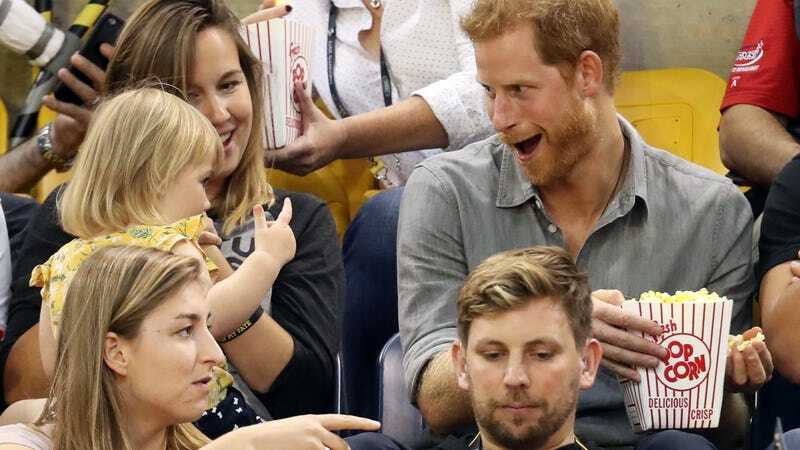 Not only is everyone all up in his business about his first public appearance with his girlfriend Meghan Markle, but now a thieving little witch child is stealing his popcorn. What does a person have to do to enjoy some sitting volleyball in peace? The towheaded pilferer is named Emily, and she’s the daughter of Hayley Henson, whose husband Dave Henson competed in the first games. It doesn’t seem like Emily cares about that, though, because like all successful career criminals, her focus on her goal is laser-sharp. I discovered in college that the best way to steal bottles of wine from on-campus events was to simply stride confidently into the catering area, smile broadly at the bored, probably stoned student employees, and walk out with as many bottles as I could fit in my arms (like four, usually). Am I monster? Yeah, but I’m also dumb, because it took me until like age 20 to learn what Emily has already mastered: The best way to get what you want is to pretend that it’s already yours. This is how most white men get jobs, by the way. Prince Harry, his defensive senses dulled by years of being swaddled in private security details, doesn’t even notice he’s being robbed. When he finally does, he plays it off like the whole thing is totally cool—because really, what choice does he have? Knowing Emily, she probably also got his wallet.